4776 West Marigold Lane Monee, IL. | MLS# 10050107 | Welcome Evers Realty Group, your number one source on the web for NW Indiana Homes for Sale, Chicago South Suburban Homes and Indiana & Illinois Real Estate. Move in ready 3 bedroom, 2 bath Ranch with just completed new carpet throughout, new kitchen & dining room flooring and freshly painted interior. 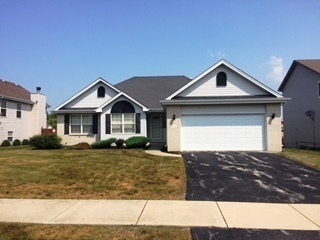 Features include great room with gas fireplace, country kitchen/dining, master suite with tub/separate shower/double sink/walk-in closet, 2 additional bedrooms, additional full bath, main floor laundry, basement, attached 2 car garage, deck and fenced yard, and clean water purification system with reverse osmosis.